. Published on April 5, 2018. Telecommuting! It’s gone from a strange-sounding buzzword to a sweeping sensation. Nowadays its normal for “Wanted” ads to talk about how new positions include some amount of telecommuting, and its no longer seen as lazy to want to do so. Here, we’ll be addressing all of those questions so that you can get up to speed on telecommuting from home. Telecommuting comes from the Greek prefix “tele” (meaning “far, far off”) and “commuting” which is regular travel to a location and back. But of course, telecommuting doesn’t literally mean “far, far off travel”. What telecommuting is is the modern concept that you don’t have to spend 9-5 every weekday in an office. To put it simply, telecommuting is working from home, or really, anywhere that isn’t the office. While usually it’s done from home (and, as we’ll discuss below, that’s often necessary for multiple reasons), some offices make clear that they don’t mind if you work from a cafe or other locations. If you aren’t sure, just ask! Telecommuting means saving money on travel. Whether you normally drive, take a train, or pay for other means of transportation, your wallet will definitely thank you. After money, time is right there on the list. Telecommuting means no more spending hours in traffic jams or standing in a hot, overcrowded train for what seems like way too long. Sure, offices may not be the least comfortable places ever, but you know what’s even more comfortable? Your own living space. Work from your own desk, eat at your own kitchen, use your own bathroom. While telecommuting requires just as much work, it’s undoubtable that every office has downtime. Instead of sitting in your swivel chair waiting for the next assignment, you’re at home! Do laundry, take care of the kids, get dinner ready. Heck, if you’ve gotten enough assignments done and have tons of time, go for a walk around your neighborhood or buy groceries! Can’t get sick from coworkers if your only coworker is your dog. Let’s face it- some people actually look forward to water-cooler convos. Working from home means that, short of conference calls or video chats, your conversations with coworkers will be pretty much limited to emails. If you’ve got a quick, burning question that you need someone on your team to answer, unless you spam their phone your best shot is to wait for an email response. No knocking on their door or coming ‘round to their cubicle! So how do I do it? What do I need? It’s simple, it’s (mostly) free, and it might actually already come on your computer (depending on whether you use Windows or Mac). Skype allows for free video calling and (if you have money on your account), incredibly cheap international calls. It’s rapidly becoming a staple of modern offices, and for good reason. While this tool is more specific to those whose jobs require social media usage, TweetDeck is a phenomenal way to keep track of all the different twitter accounts you need to keep an eye on. You can either use a web-browser form or download it. 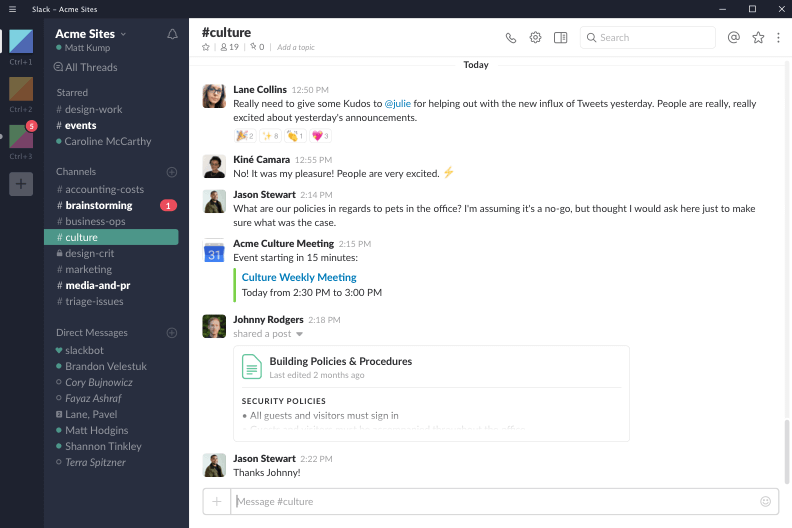 Slack is an incredibly useful instant messaging app that allows for private group conversations between individuals. You can share screens, files of nearly any kind- and its free! If you’re working from home, you should probably consider using a virtual phone system – and you can’t go wrong with MightyCall! MightyCall enables you to purchase virtual numbers through multiple different plans, and then make or receive calls from that number on your mobile phone, browser, or a softphone. For someone working from home or running their own small business, it’s a must have. Let’s get a few things out of the way here. Google does many things well. And Google Voice is pretty darn good for personal use. But those of you using Google Voice for businesses need to wake up, because you really deserve better. Much better. 6 marketing tips for your Independence Day campaign from MightyCall will help to grow your audience.